Fr. Tom reflects on the icons associated with Pentecost and the Trinity. Fr. Thomas looks at the roots of Pentecost-- the coming of the Spirit-- in Old Testament worship. St. Seraphim of Sarov taught that the aim of the Christian life is to live by the Spirit of God. Today Fr. 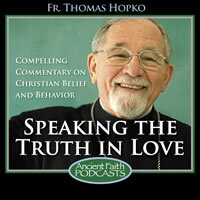 Tom explores the acquisition of the Holy Spirit. Fr. Thomas looks at the roots of Pentecost—the coming of the Spirit—in Old Testament worship.